For Breakfast this morning I toasted a Thomas Light 100% Multigrain English Muffin and topped the halves with Smucker’s Sugarless Blackberry Jam. Also had my morning cup of Bigelow Decaf Green Tea. After Breakfast I had to go to the local Kroger up the road for a couple of items for Mom then stopped by McDonald’s to pick up Breakfast for her. Did a couple loads of laundry. Then got the cart out and did some yard work; cleaned off the deck and driveway areas and raked more leaves. Ton of leaves right now! For Dinner tonight Breakfast! I prepared Thin Cut Pork Chops, Hash Browns, Scrambled Eggs and Toast. I had this same meal once before, so good had to have it again! I had 1 package of Thin Cut Pork Loin Chops I bought from Meijer in the freezer. I had sat the bag in the fridge overnight to thaw. Along with the Chops I’ll be using; 2 Eggs (Scrambled), Simply Potatoes Garlic and Herb Hash Browns, and 2 slices Aunt Millie’s Light Whole Grain Bread Buttered with I Can’t Believe It’s Not Butter. To prepare the Chops; I seasoned with McCormick’s Smokehouse Maple Seasoning. First time trying this Seasoning. Some of the ingredients are Brown Sugar, Molasses, Garlic, Onions, and Paprika. Perfect for Pork, Chicken, or Salmon. Next i grabbed a skillet and gave a spray of Pam Non Stick Cooking Spray and added a tablespoon of Extra Light Olive Oil. Heated on medium heat. When the skillet was ready added the Chops. I just cooked them about 2 1/2 minutes per side. Being thin cut, it didn’t take them long to cook. It was a good size package so we froze the ones left. The Chops turned out delicious! Moist and the McCormick Smokehouse Maple Seasoning was perfect for the Pork. 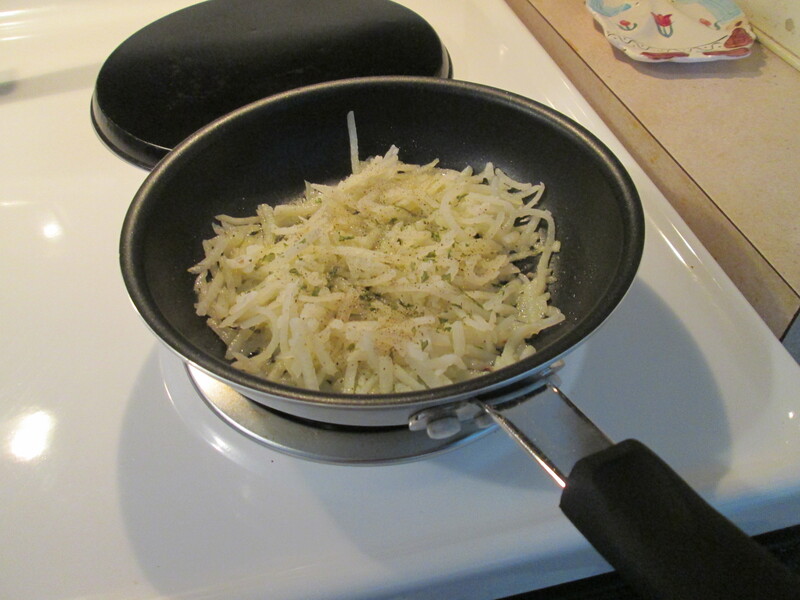 Then for a side I prepared some Simply Potatoes Garlic and Herb Hash Browns. Seasoned them with Salt and Pepper and served them sprinkled with Sargento Reduced Fat Shredded Sharp Cheddar. As both the Chops and Hash Browns were finishing I then made the Scrambled Eggs. As soon as the Hash Browns were done I removed them from the skillet and used this skillet for my Eggs. I used 2 Medium Size Eggs; also Sargento Reduced Fat Shredded Sharp Cheddar Cheese, Sea Salt, and Ground Black Pepper. To prepare them In a small bowl, whisked the Eggs and add just a splash of water. Added the Eggs, to the all ready heated skillet and cooked. Flipped the Eggs a couple of times and turned the heat off and finished the Eggs. When done I sprinkled the Scramble with some Sargento Reduced Fat Shredded Cheese. Finally I toasted a couple of slices of Aunt Millie’s Light Whole Grain Bread, lightly Buttered with I Can’t Believe It’s Not Butter. Wow, nothing like a good Breakfast for Dinner! For Dessert later a bowl of Del Monte Sliced Peaches. Simply Potatoes Garlic and Herb Hash Browns have just the right amount of delicate seasoning and they fry up perfectly to a crisp, golden brown because they’re made from fresh potatoes. They’re always fresh, never frozen so you don’t have to worry about freezer burn. No need to peel, shred and season, we’ve done it all just for you. * Fresh, never frozen, potatoes. * Prepared for you to save time and energy. Flavor You Can See! Shake on this smoky sweet blend of coarsely ground spices to liven up the flavor of chicken, pork, and salmon. Shake 1 tablespoon Seasoning per 1 pound chicken, pork or salmon before grilling or broiling. SALT, CANE SUGAR, BROWN SUGAR, MOLASSES (REFINERY SYRUP, CANE MOLASSES, CARAMEL COLOR), GARLIC, ONION, SPICES (INCLUDING PAPRIKA, CHILI PEPPER), ORANGE PEEL, RED BELL PEPPER, MAPLE SYRUP & NATURAL FLAVOR (INCLUDING SMOKE). To start my morning I toasted a couple of slices of Aunt Millie’s Light Whole Grain Bread and Scrambled some Egg Beater’s Egg Whites that I topped with a few shakes of Ortega Chipotle Taco Sauce and Sargento Reduced Fat Shredded Sharp Cheddar Cheese. I also had my morning cup of Bigelow Decaf Green Tea. Mom had the cataract taken off her left eye this morning. Mom’s cousin went with her for this one. So after Breakfast I headed off to Kroger for a few items for myself and Mom. Back home I got the leaf blower out and cleaned off the deck and driveway areas. Later did a load of laundry and cleaned the house. For Dinner tonight its Breakfast! I prepared Biscuits and Gravy w/ Turkey Breakfast Sausage Links. I think I’m going with a Breakfast Menu for the next 2 or 3 Dinners, it just sounds good! Time to mix it up a bit for Dinner. I’ll be using Pioneer Peppered White Gravy Mix, Pillsbury Grands Junior Biscuits, and Johnsonville Turkey Breakfast Sausage Links. I also had a glass of Kroger 2% White Milk to drink. To make the Gravy I’m using a packet of my favorite Gravy, Pioneer Peppered White Gravy Mix. So easy to prepare and absolutely delicious! To prepare it I get a small sauce pan and give it a light spray of Pam non Stick Cooking Spray w/ Olive Oil. I add a 1 1/2 cups of Cold Water to the pan and heat it on high to rolling boil. As that is heating up I preheated the oven for the Pillsbury Biscuits and I mixed the Gravy. In a measuring cup I added a 1/2 cup of Cold Water and then added the Gravy Mix to the Water and stirred until it smooth. When the Water was boiling I added the Gravy Mix. Turned down the heat a notch or two and started stirring the Mix and Water. Continued stirring until it started to thicken. Removed it from the heat and continued to stir it for about 30 seconds. I put the lid on the sauce pan and set it aside until I was ready to use it. Time to bake the Pillsbury Grands Junior Biscuits! Took a small baking pan and sprayed a light coat of the Pam Cooking Spray on it. Added the Biscuits and popped the pan in the oven. I’m baking them 400ᵒ F for 10 minutes. And as all Pillsbury Biscuits, they came out perfect. Flaky, hot, and ready to serve. Put the Biscuits on a paper towel lined plate and covered them with a towel until ready to use. Finally as the Biscuits were baking I prepared the Johnsonville Turkey Breakfast Sausage Links. Another delicious and easily prepared item. I buy these all the time, my favorite. I took a small skillet and sprayed it with the Pam Cooking Spray. Heated it on medium heat. Cooked them for 9 minutes, turning them several times. I love these Sausage Links! I prepared the whole package, Mom is having the Breakfast Dinner with me. Her surgery went great, now both eyes are done! To serve everything, I got a bowl and added 2 Biscuits, topped them with the Gravy, and added a couple of the Sausage Links. Then chowed down! Everything is so good, Mom really enjoyed it she had not had Breakfast or Lunch. Also had a glass of 2% White Milk. For Dessert/Snack later a bowl of Skinny Pop – Pop Corn with a Diet Peach Snapple to drink. PIONEER® GRAVY MIXES—FROM BROWN GRAVY TO CHICKEN GRAVY TO COUNTRY GRAVY MIX. Just about every meal gets that much better when you add the rich flavor of gravy. One taste of our Pioneer gravy and you’ll understand why. Rich and flavorful, all of our gravy mixes are ready in just three easy steps. And we offer a whole pantry full of flavors—from brown gravy mix to country gravy mix. So you can serve the perfect gravy to complement any meal. It’s true that the best meals come with gravy, and the best gravy mixes come from Pioneer. The gravy tastes that will bring back memories of dinner at Grandma’s. Pioneer gravy mixes not only taste great, but are convenient, use quality ingredients and make two cups of gravy, twice as much as most other mixes. They’re the perfect complements to your favorite meats and potatoes. But don’t forget delicious veggies, too. Plus, check out the recipe favorites on each package. Try over a warm biscuit for a great way to start the day. 1 – Place refrigerated sausage links in a nonstick skillet. For Breakfast this morning I toasted a Healthy Life Whole Grain English Muffin and topped it with some Smucker’s Sugarless Blackberry Jam. Also had a cup of Bigelow Decaf Green. It’s another beautiful morning out there, 60 degrees and sunny. For the day it was 78 degrees and sunny for the day. After Breakfast I got the cart out, along with hedge clippers and leaf blower. Yard work today. Trimmed the bushes around the side and back. Also had to trim the vines along the driveway, the vines grow way too fast! Everything done I took a ride around the neighborhood and enjoyed the day. For dinner tonight its a Breakfast Menu! I prepared Eggs, Hash Browns, Turkey Sausage, and Whole Grain Toast. Nothing like a hearty, healthy, and delicious Breakfast for Dinner too! I’ll need one Egg, Simply Potatoes Shredded Hash Browns, a couple of Jennie – O Turkey Breakfast Sausage Links, and 2 slices of Aunt Millie’s Light Whole Grain Bread. So I got out a couple of small skillets and got the toaster fired up. Heated up both skillets, sprayed with Pam Cooking Spray in both and added Extra Light Olive Oil to one of them. In the skillet with no oil I started to fry the Jennie – O Turkey Sausage Links and the skillet with Oil, I prepared the Simply Potatoes Hash Browns. When both were cooked I put each one into separate bowls and set aside. Then I started toasting the Bread. Next in the skillet that had the Hashbrowns I fried my Egg. Seasoning the Egg with Morton’s Lite Salt and Ground Black Pepper. When the Toast was done I buttered both slices with I Can’t Believe It’s Not Butter. As the Egg was ready I grabbed a plate and plated everything! And what a Breakfast Dinner! Eggs, Hash Browns, Turkey Sausage, and Toast. To drink I had a glass of Kroger Brand CarbMaster Chocolate Milk, I love this stuff! For Dessert/Snack later a bowl of Skinny Pop – Pop Corn and diet Peach Snapple to drink. A delicious way to start the day with no-gluten links that have 65 percent less fat than pork sausage. * Spray skillet with nonstick cooking spray. * Preheat skillet over medium-high heat. * Place links in hot skillet. * Turn occasionally and cook approximately 15 to 17 minutes. Always cook to well-done, 165º F. as measured by a meat thermometer in the middle and ends of links. Had a light Breakfast of a Healthy Life Whole Grain English Muffin topped with Smucker’s Sugarless Blackberry Jam. After that I needed a few items from the store so I headed up to Kroger, wanted to go before the rains moved back in. Back home did a couple of loads of laundry for Mom and tided up around the house. Not much going on after that. The rain started about noon and continued the rest of the day. It’s a cool, gloomy, foggy, and rainy Saturday. For dinner tonight Breakfast! I prepared Sausage and Cheddar Grits with Fried Egg and Wheat Toast. Came across the idea in the latest issue of Cooking Light. The original recipe and web link is at the end of the post. The original recipe makes 4 servings, I just made 1 serving. To make the dish I’ll need; Sea Salt and Pepper, 1 packet of Kroger Brand Instant Butter Flavor Grits, 1 serving Jennie – O Turkey Ground Breakfast Sausage, Sargento Reduced Fat Cheddar Cheese, 1 Medium Egg. To prepare the dish starting with the Grits; Just followed the easy instructions. Emptied the contents of 1 package of the Grits into a bowl. Then added a 1/2 cup of boiling water. Stir and served. Can’t get much easier that! The Grits were 100 calories, 1 fat gram, and 20 net carbs. On to preparing the Turkey Sausage. 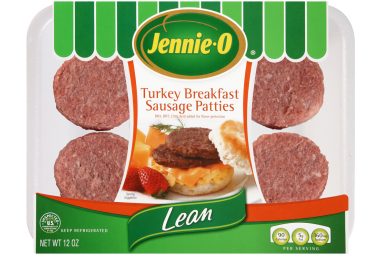 I used Jennie – O Turkey Ground Breakfast Sausage instead of Pork Sausage, cutting the calories, fat, and carbs. I used a medium size skillet that I sprayed with Pam Cooking Spray and heated on Medium Heat. When the skillet was heated I added 1 serving of the Ground Turkey Breakfast Sausage. Stirred it occasionally with a wooden spoon (to crumble any large pieces) until fully cooked, about 14 minutes. Removed the Sausage from pan with a slotted spoon and set aside. Left what little accumulated fat in pan. While I had the pan hot and sausage out I also made 3 Turkey Sausage Patties for my Breakfast tomorrow, just reheat and serve in the morning. Then took the Grits, still in the sauce pan, and stirred in the Cheese and cooked Turkey Sausage. I then grabbed a couple of slices of Klosterman Wheat Bread and toasted them. Topped both slices with I Can’t Believe It’s Not Butter. Returned the frying pan with fat to medium-high heat. Cracked the Egg into frying pan. Cooked until the white was set but yolk are still runny, about 3 minutes. Spooned the grits mixture into a bowl and topped with the egg. Served it with the Buttered Toast. One delicious Breakfast/Dinner! The Sausage and Cheese Grits were incredible and topped with the Runny Sunnyside Up Egg just added to the flavor. Saved calories, fat, and carbs by using; Jennie – O Ground Turkey Breakfast Sausage, Sargento Reduced Fat Shredded Cheddar Cheese, Medium Size Egg over a Large Size Egg, and using Wheat Toast over White Bread Toast, and using I Can’t Believed It’s Not Butter over Butter without sacrificing any flavor. Breakfast Sausage Rolls contain less fat than regular pork sausage. * Remove casing and slice roll into 1/2 inch thick patties. * Preheat oven to 400 °F. * Spray shallow baking pan with nonstick cooking spray. * Place patties in pan. * Bake approximately 20 to 25 minutes. * Always cook to well-done, 165º F. as measured by a meat thermometer. * Place patties in hot skillet. TURKEY, SEASONING (SALT, DEXTROSE, NATURAL FLAVOR, HYDROLYZED CORN PROTEIN, BHA, BHT, CITRIC ACID), ROSEMARY EXTRACT. In a medium-size saucepan over high heat, bring 2 1/2 cups water to a boil. Add salt, reduce heat to medium and slowly whisk in grits. Cook, uncovered, stirring frequently, until grits are tender and thickened, about 20 minutes. Using a sharp paring knife, cut off ends of sausage casings. Squeeze out sausage meat and discard casings. Cook sausage in a medium-size frying pan over medium-high heat, stirring occasionally with a wooden spoon (to crumble large pieces) until fully cooked, about 5 minutes. Remove sausage from pan with a slotted spoon and set aside. Leave accumulated fat in pan. Remove grits from heat and stir in cheese and cooked sausage. Return frying pan with fat to medium-high heat. Carefully crack eggs into frying pan one at a time. Cook until whites are set but yolks are still runny, about 3 minutes. (For firmer yolks, flip eggs and cook for 1 minute longer.) Spoon grits mixture onto individual plates and top each serving with an egg. Serve immediately. Somewhat hotter and more humidity outside today. Partly Cloudy and a passing shower on and off all day. Had Breakfast and my morning workout, then finished up on some house cleaning. I wanted to get the car washed but weather not letting me today. I took a drive over to neighboring Fairfield to find out where my eye exam is located for Monday morning, checking for Glaucoma. Hope this turns out to be a false alarm, I’m dealing with enough I think. For dinner tonight it was a Breakfast menu! I prepared Eggs, Hash Browns, Turkey Sausage, and Wheat Toast. Nothing like a hearty, healthy, and delicious Breakfast. So I prepared an Egg Sunnyside Up, seasoned with Sea Salt and Ground Black Pepper and pan fried in Canola Oil. I then prepared a couple of Jennie – O Turkey Breakfast Sausage Links. Just as delicious as Pork Sausage but healthier. While the Sausage Links were cooking in another skillet I prepared some Hashbrowns. I used Simply Potatoes Hash Browns. The last item for my Breakfast Dinner was what else but Toast! I toasted up a couple of slices of Klosterman Wheat Bread. Since I’ve started using Pita Bread so often my full loaf of Bread had been going stale on me before using it all. So I started using Klosterman Bread because you can purchase it in 1/2 loaves! Plus it’s a better tasting and fresher Bread than most other Wheat Breads. So I toasted 2 slices and buttered them with I Can’t Believe It’s Not Butter. I also had a cold glass of 2% White Milk. Breakfast for Dinner is a good thing! For a dessert later a Jello Sugar Free Dark Chocolate Pudding. 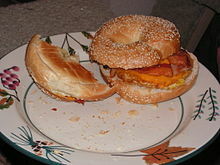 In North America, a breakfast sandwich is any sandwich filled with foods associated with the breakfast meal. Breakfast sandwiches are served at fast food restaurants and delicatessens or bought as fast, ready to heat and eat sandwiches from a store. Breakfast sandwiches can also be made from scratch in the home. 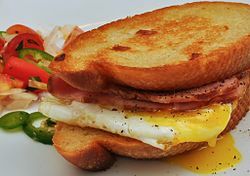 Breakfast sandwiches typically are made using breakfast meats (generally cured meats such as sausages, patty sausages, bacon, country ham, Spam and pork roll), breads, eggs and cheese. These sandwiches were typically regional specialties until fast food restaurants began serving breakfast. Because the types of bread common, such as biscuits, bagels, and English muffin were similar in size to a fast food hamburger buns, they made an obvious choice for fast food restaurants. Unlike other breakfast items, they were perfect for the innovation of the drive-through. These sandwiches have also become a staple of many convenience stores, that serve them as take-away items. Although the ingredients for the breakfast sandwich have been common elements of breakfast meals in the English-speaking world for centuries, it was not until the 19th century in the United States that people began regularly eating eggs, cheese, and meat in a sandwich. What would later be known as “breakfast sandwiches” became increasingly popular after the Civil War, and were a favorite food of pioneers during American westward expansion. The first known published recipe for a “breakfast sandwich” was in an 1897 American cookbook. * Hard roll: The traditional breakfast sandwich of the northeast’s tri-state region of New York, New Jersey, and Connecticut. It is believed to be one of the earliest forms of the breakfast sandwich in the United States. It consists of a hard roll, eggs, cheese and sausage, bacon or ham. In New Jersey, a common breakfast sandwich is the Jersey Breakfast which consists of pork roll, egg, and cheese on a hard (Kaiser) roll. * Biscuit: Consists of a large, or cat-head biscuit, sliced, on which meat, cheese, or eggs are served. Popular biscuits include: Sausage biscuit, bacon, tomato, and country ham. Fast food restaurants have put smaller versions of fried chicken fillets on biscuits to create chicken biscuits. Scrambled eggs and/or American cheese are often added. * Bagel Sandwiches: Due to its Jewish connection, bagels often contain foods associated with the community, such as deli meats, lox or other smoked fish, and cream cheese. * English muffin: Generally contains egg and cheese with either breakfast sausage or ham. Often served in U.S. fast food outlets such as McDonald’s and Starbucks. * Toast: Toasted bread is one of the oldest forms of breakfast sandwich in America, and the closest to the original sandwich in form. While any number of items might be served on toast, eggs and bacon are the ones most associated with breakfast. * Specialty breads: Mostly served by restaurant chains, there are other breakfast sandwiches that do not use one of the common breakfast breads used in the United States. Burger King uses a croissant to make a breakfast sandwich called the Croissan’Wich, or croissant sandwich, depending on the market. McDonald’s offers its traditional biscuit fillings on a sandwich made from maple flavored pancakes called a McGriddles. Dunkin’ Donuts has a waffle sandwich that is similar to the McGriddles. These can be found at American fast food franchises worldwide. 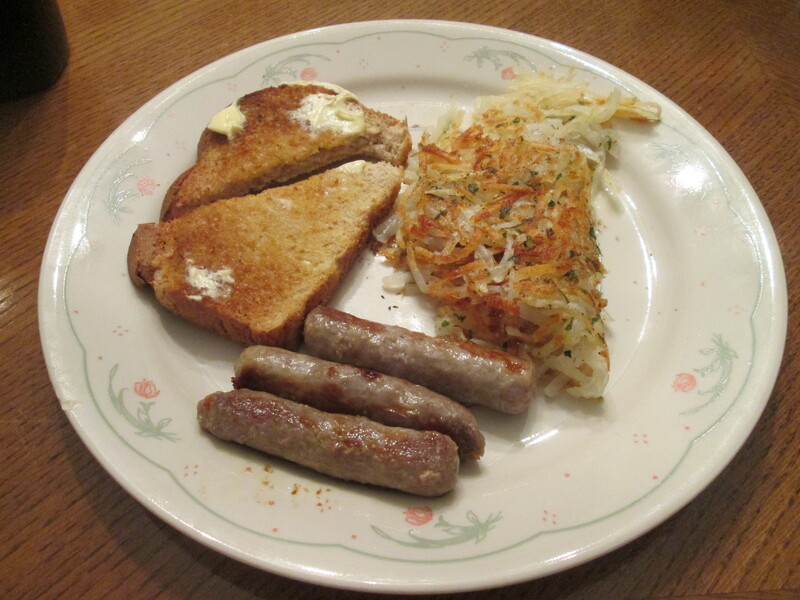 Today’s Menu Breakfast – Sunnyside Up Egg, Hash Browns, Turkey Sausage Breakfast Patties, and Wheat Toast. Started my day off with an Egg White, Canadian Bacon, and English Muffin Breakfast Sandwich! Used Egg Beater’s Egg Whites. Finished up laundry for my Mom and then outside into a beautiful Spring Day. Got the cart out and did a few things around the house then rode down to the neighborhood lake for a while. Beautiful day out, sunny and high near 70 degrees! For dinner tonight a real comfort food Breakfast! 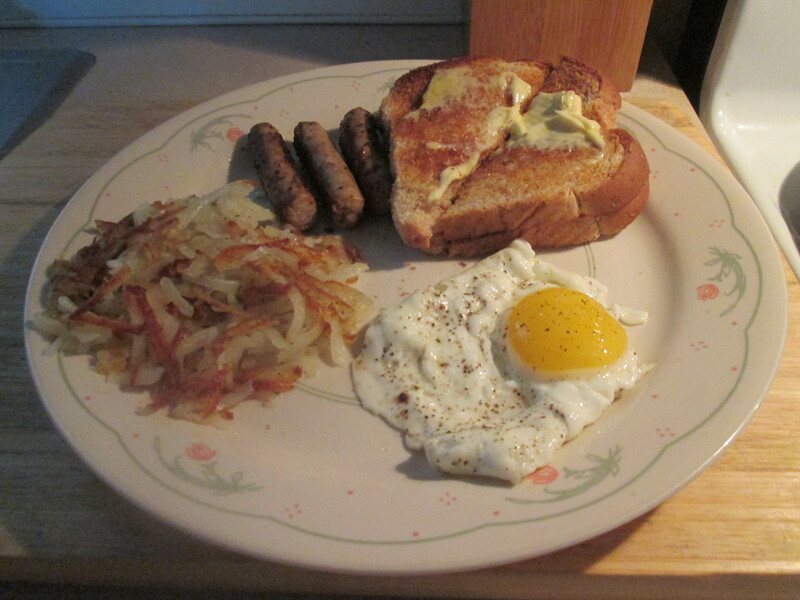 I prepared; a Sunnyside Up Egg, Hash Browns, Turkey Sausage Breakfast Patties, and Wheat Toast. It’s Breakfast Prime Time Tonight! In one small skillet I prepared Egg Sunnyside Up, seasoned with Sea Salt and Ground Black Pepper and pan fried using Extra Virgin Olive Oil. I then prepared a couple of Jennie – O Turkey Breakfast Sausage Patties in a second small skillet. Just as delicious as Pork Sausage but healthier, try the Jennie – O Turkey and you’ll never go back! While the Sausage Patties were cooking in another skillet I prepared some Hashbrowns that I topped with a bit of Sargento Reduced Fat Shredded Sharp Cheddar Cheese. 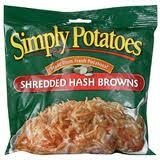 I used Simply Potatoes Hash Browns, the only brand other than Bob Evans that I use for Hash Browns. I like Simply Potatoes Hashbrowns over Bob Evans because they have fewer calories and seem to fry up better. The last item for my Breakfast Dinner was what else but Toast! I toasted up a couple of slices of Klosterman Wheat Bread. So I toasted 2 slices and buttered them with I Can’t Believe It’s Not Butter. I also had a cold glass of 2% White Milk. A Breakfast proudly served for any meal! Breakfast Food items might be the most filling and hardy foods of any other, for some reason. Nothing like a good Breakfast anytime, any meal! For dessert later tonight a Jello Sugar Free Double Chocolate Pudding. * Turn occasionally and cook approximately 13-15 minutes. * Always cook to well-done, 165°F. as measured by a meat thermometer in the center of the patty. TURKEY, CONTAINS 2% OR LESS SEASONING (SALT, DEXTROSE, SPICE, SPICE EXTRACTIVES, HYDROLYZED CORN PROTEIN, BHA, BHT, CITRIC ACID), NATURAL FLAVORING, CALCIUM LACTATE. NO GLUTEN. Woke up this morning starving! 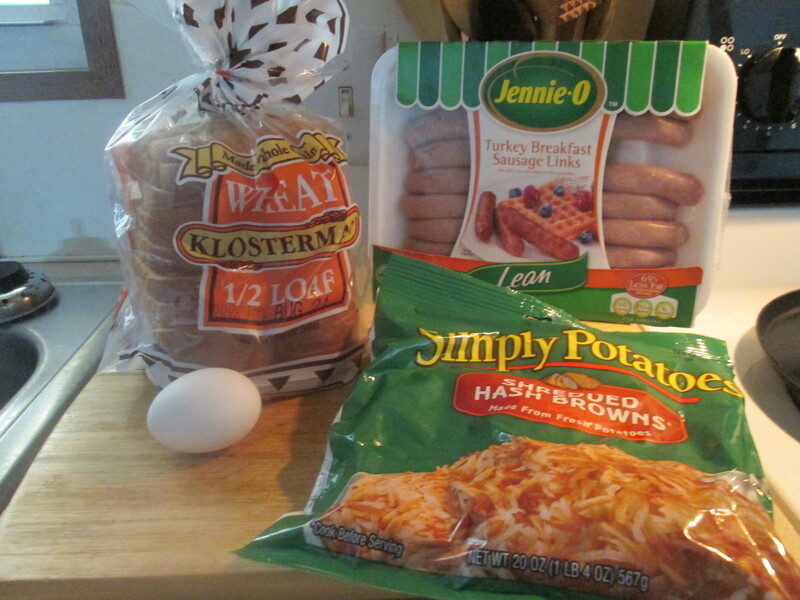 So I started my day off with some Jennie – O Turkey Breakfast Sausage Links, Simply Potatoes Hash Browns, a slice of Buttered Klosterman Wheat Bread, and a cup of fresh brewed Bigelow Decaf Green Tea. 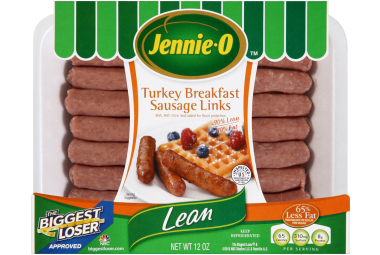 I love the Jennnie – O Turkey Breakfast Sausage Links, only 65 calories per serving (2 Links) and 0 carbs! Now I’m ready for the day! * Always cook to well-done, 165°F. as measured by a meat thermometer in the middle and ends of links. TURKEY, CONTAINS 2% OR LESS SEASONING (SALT, DEXTROSE, SPICE, SPICE EXTRACTIVES, HYDROLYZED CORN PROTEIN, BHA, BHT, CITRIC ACID), NATURAL FLAVORING, CALCIUM LACTATE. MADE WITH CALCIUM ALGINATE CASING. NO GLUTEN. Just wanted to pass along this Breakfast Sandwich along to everyone. It’s from the http://www.cooksrecipes.com/index.html website. Spicy Bacon and Cheese EggwichA new twist on the greasy breakfast sandwich, this complete grab-and-go breakfast features a high-protein egg substitute, tasty turkey bacon and cheddar cheese sandwiched together in a whole wheat English muffin. And, it serves up 12 grams of protein. * Spray 10-inch nonstick skillet with nonstick cooking spray. Heat over medium heat. Add Better’n Eggs and stir in hot pepper sauce. As eggs start to set, use spatula to lift edge, letting uncooked eggs flow to bottom of skillet. Cook until Better’n Eggs are set but still moist. Sprinkle shredded cheese on top and then fold over the Better’n Eggs so cheese melts in the middle. * Place turkey bacon on microwave-safe plate. Cover with paper towel. Microwave on HIGH 30 to 40 seconds or until warmed. * Toast each half English muffin in toaster. Spoon about 1/2 cup Better’n Eggs mixture on top of two toasted muffins. * Top each with one piece cooked bacon. Top with remaining toasted muffins. 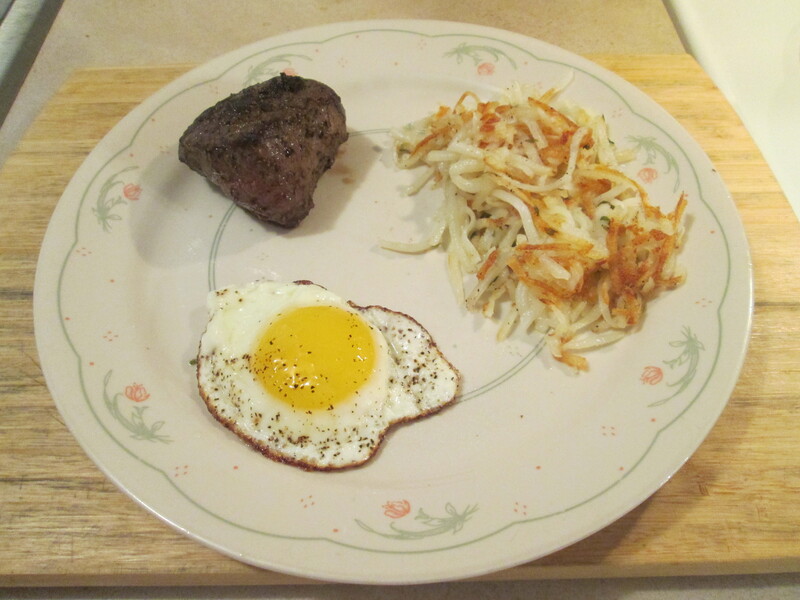 Nutritional Information Per Serving (1/2 of recipe): Calories: 226, Fat: 6 g, Cholesterol: 15 mg, Sodium: 534 mg, Carbohydrate: 27 g, Dietary Fiber: 5 g, Protein: 17 g.
Today’s Menu: Breakfast for Dinner – Buffalo Sirloin Steak w/ Eggs, Hash Browns, and Wheat Toast. The day started off with a light freezing rain. A lot of accidents early this morning and a lot roads were shutdown. By 10:00 this morning it was 35 degrees and everything melted. Turned to a decent day, mostly sunny and about 50 degrees. Puttered around the house doing a few things and then an afternoon of College Football. For dinner tonight Breakfast! 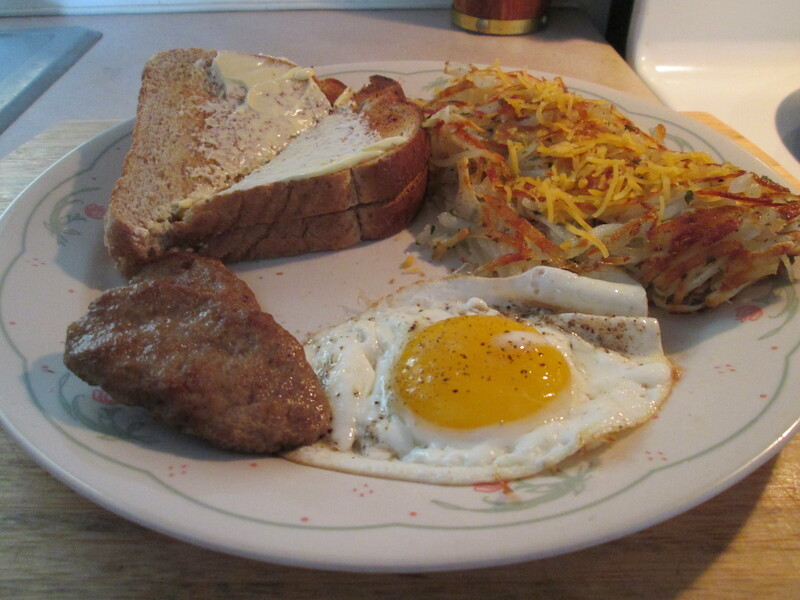 I prepared a Buffalo Sirloin Steak w/ Eggs, Hash Browns, and Wheat Toast. A good Breakfast for Dinner tonight sounded like a winner, and it was! I’ve been having a light Breakfast lately, so I’ve been wanting a full and healthy Breakfast. So tonight for dinner that’s what I had, Buffalo Sirloin Steak w/ Eggs, Hash Browns, and Wheat Toast. I used a Wild idea Buffalo 5 oz. Petite Sirloin, the finest cuts of Buffalo around! I seasoned it with McCormick Grinder Sea Salt and Black Peppercorn. Heated up a small skillet on medium heat, adding 1 tablespoon of Extra Virgin Olive Oil as it was heating up. I then pan fried the Buffalo Sirloin, fried it about 4 minutes per side. It came out a perfect medium rare, nice char on the outside and a little pink in the middle. 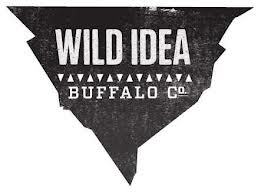 As I’ve said before Wild Idea Buffalo is most delicious tasting Buffalo Steak there is, bar none! I switched from using Beef to Buffalo several years ago. For me Beef doesn’t come close to Buffalo, not to mention it’s healthier than Beef also. To go with my Steak I prepared one Egg Sunny Side Up, a serving of Simply Potatoes Hash Browns, and 2 slices of Toasted Klosterman Wheat Bread (Buttered with I Can’t Believe It’s Not Butter). Now this is a Breakfast! The Wild Idea Buffalo Steak ties everything together. Sometimes Breakfast is makes a mighty fine Dinner! For dessert later a Jello Sugar Free Dark Chocolate Pudding. Famous for their flavor, these juicy steaks are perfect for the grill. The small size makes for a great meal for one. 5 oz. Length of cooking time depends on the thickness of steaks. Adjust to your personal preference. * 1/2″ thick: 2 minutes each side. * 1″ thick: 3 minutes first side, and 2 minutes second side for medium rare. * 1½” thick: 4 minutes each side for medium rare. For thicker cuts, increase cooking time by 1 minute per half-inch per side, for medium rare. * Rare – 130 degrees. Medium-rare – 140 degrees. Medium – 155 degrees.